Is your school floor in need of some maintenance? AJ Floor Sanding are specialists in school hall floor sanding with many years of experience in this field. We can sand your floor back to it’s former glory with minimal disruption to staff and pupils. As a family run business, we are keen to maintain our reputation as a trustworthy and honest provider of floor sanding services and welcome enquiries from schools, colleges and universities. 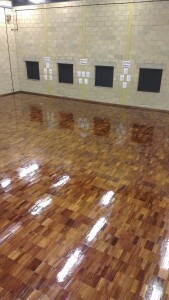 Leave your floor with a smooth and stunning finish, which won’t go un-noticed by staff and pupils. Whatever condition your school floor is currently in, call AJ Floor Sanding on 07901 566644 or alternatively, fill out the online form on this page to request a quotation. We look forward to hearing from you.